NordGlass is a brand of AGC, one of the world’s leading glass companies. NordGlass is a glass brand with a wide range of products for the automotive replacement market. 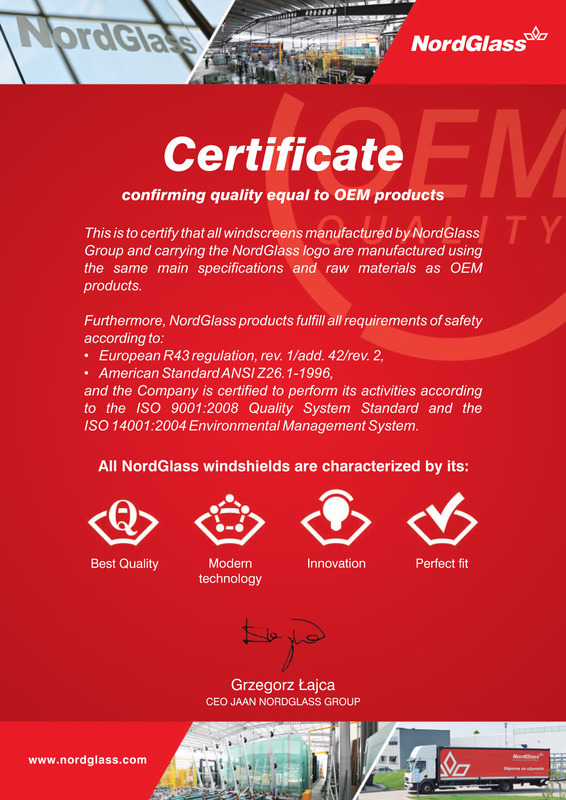 All NordGlass windscreens meet industry ECE R43 quality standards and the brand has earned a solid reputation with customers for its service level, reliability and value for money. You can always count on NordGlass for a solution! AGC branded replacement glazings are high-quality products, matching the strict specifications of AGC OEM products fitted to new vehicles. All AGC branded replacement products are manufactured in plants with ISO/TS16949 certification and according to quality specifications that significantly exceed the standard ECE R43 regulation. In quality terms , AGC ARG glazing can be considered as Original Spare Parts or equivalent. This superior quality is maintained by AGC’s policy of continual testing throughout the manufacturing process and a final fitting test before mass production. By fitting AGC glass, you can be sure to deliver the best standards of performance and safety.